Every year, the World Bank's World Development Report takes on a topic of central importance to global development. 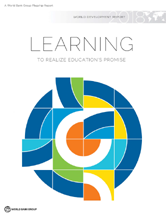 The 2018 Report, Learning to Realize Education's Promise, is the first ever devoted entirely to education.This title explains that education has long been critical for human welfare, but is even more so in a time of rapid economic change. Will learning metrics narrow the vision for education? How can external actors support initiatives to improve learning?